A tree decorated with lottery tickets holds the promise of riches. If you’re looking to boost benefit auction revenues and your event is late November or December, your acquisitions strategy could include decorated holiday trees. 1. 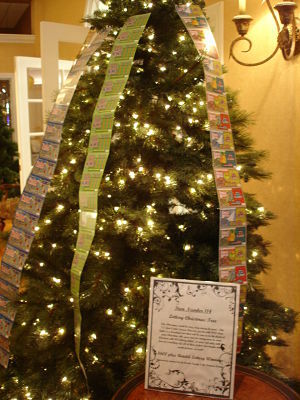 At one school auction gala, one of the live auction items was a tree decorated with 100 $1 scratch-off lottery tickets. Not only is the winning bidder buying a lovely tree, but with a hundred scratch-off tickets, the bidder could be taking home a goldmine. 2. At another school auction, the student-decorated trees sold for top dollar. The school serves autistic students and some exceptional artists reside among the student body. 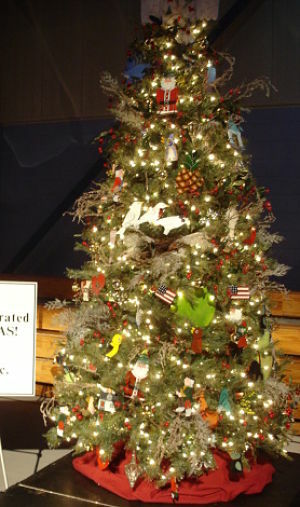 The school sold the opportunity to have a small group of students visit the winning bidder’s home or business and decorate a tree with hand-crafted ornaments made at the school. Here’s an elegant tree ready to be enjoyed at home, and professionally decorated by a local design house. Some years the school has sold the trees at $10,000 apiece, doubling, tripling, or even quadrupling the sale when interest was strong. 3. Ask a professional decorator to create a signature tree. The tree will draw greater interest from the crowd than, say, a 2-hour home decor consultation. You might offer to buy the tree, and he or she can decorate it. The bonus is that a beautiful tree with signage like, “Decorated by Joan Thomas Design Inc.” will give the donor much more publicity than a silent auction donation. One reason I prefer fall and winter benefit auctions is because it’s easy to naturally incorporate the holidays into your plan. Make the most of your date by branding it to the season with a holiday tree. What unique ideas and perfect for the season! what an awesome idea! definitely going to pass this on to my clients and friends! Great examples Sherry! I have an idea for a festival of trees community wide event where each tree is created and benefits a different nonprofit. Maybe some of them would partner with businesses (such as interior designers) to create the trees. This would take a lot of planning and buy-in from all the different parties. Guess I should start working on 2011 now!